How did you get into meteorology? Ever since I was a kid! We lived in Kansas for a while. My dad was in the Navy, so we moved around a lot. I saw a tornado when I was a kid. This was in Kansas in 1968. And ever since then I was just fascinated with weather. I knew what I wanted to be, I knew I wanted to be a meteorologist. And then we moved to the East coast to Norfolk, Virginia, and I became interested in hurricanes. There was not much activity in the 70s though, especially along the East coast. But I had an interest in hurricanes and I always wanted to work at the Hurricane Center. With so little hurricane activity when you were growing up, how did you get focused on tropical meteorology? I took the long way around to get to NHC. I went to Old Dominion University and got my Bachelor of Science degree in meteorology and then I started work in the (NOAA) National Ocean Service. 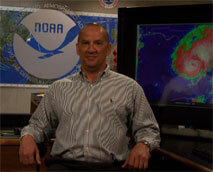 I started with the (National) Weather Service in 1987 as an intern at the World Weather Building. And then I realized I wanted to get to the Hurricane Center and focus on tropical meteorology. One of the things I got to do as an intern for forecaster development was I had an opportunity to train at the Hurricane Center during the landfall of Hurricane Hugo (1989). It was the week of Hugo. I arrived when Hugo hit Puerto Rico and left the day after it hit Charleston, South Carolina. And it was during that week of training that I actually got to meet Max Mayfield and establish connections down here. That went a long way in my getting hired here the following year in 1990. I was in the Tropical Satellite Analysis and Forecast Branch, the predecessor to what is now TAFB (Tropical Analysis and Forecast Branch). I worked there three and half years as a forecaster. From there I went to the Wakefield (Virginia weather office) for six years as the SOO (Science and Operations Officer). I wanted to come back to NHC, hopefully to become hurricane specialist. But careers taking twists and turns, I ended up being a lead forecaster for TAFB and now the Branch Chief. But I have seen your name on the bottom of hurricane advisories. Yes, I have worked as a hurricane support meteorologist. We started that program in 2002 and so every season I have worked as an HSM in terms of composing (advisory) packages, mainly for east Pacific systems but I have done a few Atlantic systems. Tell me about TAFB. They seem to be the unsung heroes at the Hurricane Center. The hurricane specialist unit receives a lot of media attention, but what I like to stress with TAFB is we are sort of behind the scenes. We do provide critical support to the hurricane specialist unit during the peak of the season. For instance, a lot of folks probably don't know that the satellite intensity estimates comes from our unit. We provide them with microwave satellite fixes and, in addition, we also run tropical rainfall guidance for the Caribbean nations. No, we are not up front writing advisories, but when a tropical cyclone is east of the Windward Islands, one of the few intensity estimates that the hurricane specialists get is from our unit. A lot of folks don't know that. So during the hurricane season, you are the first firewall? Yes, that's a good way to put that, we are the first firewall because, along with the Satellite Analysis Branch up in Washington DC, we provide this important information. Yes, absolutely. That's the tropical mission, but you are there year round, every hour of the day. What else goes on? We do have marine weather forecasts and we provide them for a very large portion of the tropical Atlantic, the tropical East Pacific and the South Pacific. In fact, our area is one of the largest in the world, 14 million square miles. We produce more than 100 graphic products a day. In addition, we coordinate with other centers in creating one of our most useful products, and that is the unified surface analysis. We are a unique unit in the Weather Service in that we not only do oceans but we do tropical meteorology as well. What does being the Branch Chief mean to you personally and professionally? It represents a big achievement for me. I've got 13 years experience as a lead forecaster and, you know, I really feel very passionate about the unit as far as the work we do because I really feel strongly that we are a unique entity in the Weather Service and we really need to get our name out there. We have enough pride in our products, we have enough products and so forth that we really stand on our own. Certainly the marine community would be lost without TAFB. Yes, it's warm down here year round. We get a lot of day boaters or short sails down here. We get a lot of calls from people going from Florida to Cozumel, or even to the Bahamas, the Grand Bahama Bank and also the Caribbean. That's a heavily traversed area in terms of cruise ships. So absolutely, they do depend on our products. We serve a very important purpose. What's the most satisfying part of the job? It's that fact that we make a difference in a lot of people's lives in terms of the marine forecasts. People make decisions based on our forecasts. To run the whole unit, potentially develop new products and meet our customers. needs, I realize the enormity and the importance of the position. You have the ability to mold the unit into what you think it is and to leave your lasting impression not only on the unit but the National Hurricane Center products, that's a pretty tall order. We've made tremendous strides in producing gridded marine forecasts. This was almost a concept just six months ago but is now to the point where we are producing gridded marine forecasts. Right now there are gridded marine forecasts out there, they are being provided by private entities, but all they are are pre-packaged model data. What we're going to be providing is actually value added forecaster input to the model data, based on our expertise, our knowledge of the local bathymetry and marine effects. So when our gridded forecasts come on line, the marine community is going to have something above pre-packaged model data. They're going to be getting value-added products that have never been provided before. Users can pull down the grids, they can display whichever fields that they want, they can customize their own route forecast, and so forth. That is going to be a big leap. That could be coming on line later this year or next year. It will also improve efficiency in producing the forecast. We're exploring new products such as giving detailed tropical wave analyses. That's one thing I thing has really been missing over the years, an actual detailed analysis forecast, the dynamics of individual tropical waves, perhaps even a forecast of which ones could become tropical cyclones. We'd like to explore providing quantitative precipitation forecasts for the Caribbean Islands. A lot of our rainfall events don't come from organized tropical systems in terms of tropical cyclones. Sometimes we get the passage of a very strong wave or even an upper level low that will stall over, say, Hispaniola, and then provide two to three days of very heavy rainfall. Another thing we want to get into is harmful algae bloom forecasts with detailed wind forecasts that would be driven off of our gridded marine forecasts.